GA COAM Gross Receipts Rule (50 Percent Rule) - Lucky Coin Inc.
(3) “Gross retail receipts” means the total revenue derived by a business at any one business location from the sale of goods and services and the commission earned at any one business location on the sale of goods and services but shall not include revenue from the sale of goods or services for which the business will receive only a commission. The sale of goods or services for which the business will receive only a commission shall not be include the sale of any item which the business has purchased for resale. Revenue shall not include sale of goods and services at wholesale. (b) (1) No location owner or location operator shall derive more than 50 percent of such location owner’s or location operator’s monthly gross retail receipts for the business location in which the Class B machine or machines are situated from such Class B machines; provided, however, that revenues that are due to a master licensee or the corporation or noncash redemption that is earned by the player shall not be deemed revenue derived from Class B machines. The worksheet will be utilized by the Compliance Inspectors and auditors during a detailed inspection of a Class B LLH to determine whether it is in compliance with the “Gross Retailer Receipts 50 Percent Rule”. Inspectors and auditors may examine the LLHs financial documents from an extended period of time (usually more than one month) to determine whether the LLH is in compliance. The worksheet is protected and the user can only input data in the orange-highlighted sections and the calculation result will be displayed in the yellow-highlighted section. Any result of more than 50 percent of gross retail receipts from COAMs is a violation of the law. 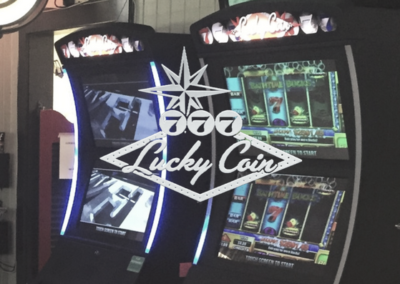 If you have any questions about the law on GA COAM, regulations are, or if you are interested in working with Lucky Coin, you can contact us at info@luckycoininc.com, call us at 1-855-34-LUCKY.